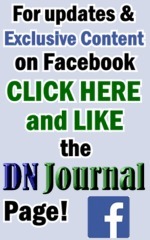 veterans Jason Thompson and Dwayne Walker but it was aimed to unite a much broader audience including the startup, domain branding and investment industries. 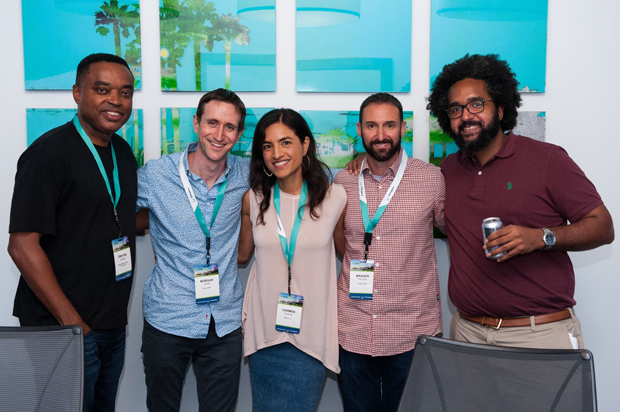 Above: Domain Startup Summit Founders Dwayne Walker (far left) and Jason Thompson (far right) with three of their judges for the Pitchfest session - a show highlight that gave startup owners a chance to pitch their business ideas to the investment community. The judges are (left to right after Dwayne) Morgan Linton, Carmen Palafox and Braden Pollock. 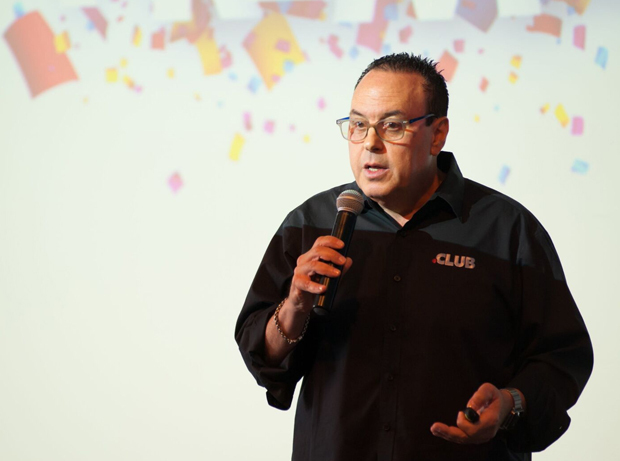 Below: After Walker and Thompson gave their welcoming comments, the conference got underway Saturday morning (July 30, 2016) with a Keynote Address - titled Dropping Vwls Is So 2004: How .CLUB And Other New Domains Are A Smarter Branding Bet For Startups & Entrepreneurs Worldwide - from the .CLUB Registry's Chief Marketing Officer Jeff Sass. 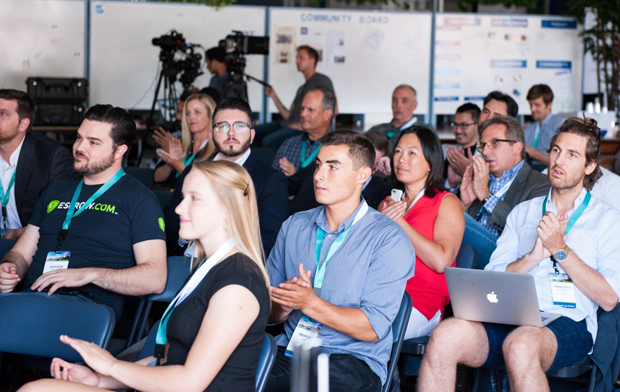 Above: a cross section of the audience sitting in on the Domain Startup Summit's full day of business sessions Saturday. 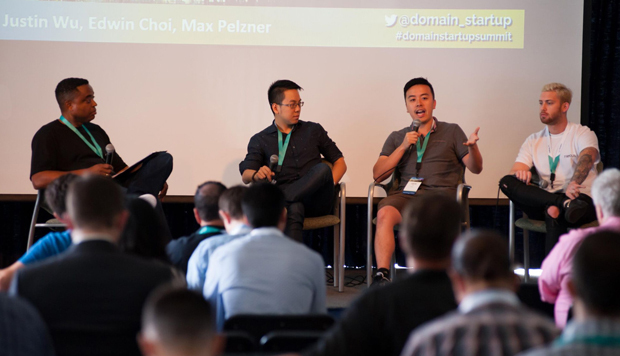 Below: The day's first panel discussion - Growth Hacking & Growth Engines for Startups, Tech Companies and Brands - featured (left to right) moderator Dwayne Walker, Edwin Choi (VP, Mobovida), Justin Wu (Growth.ly) and Max Pelzner (ThinkBox.io). 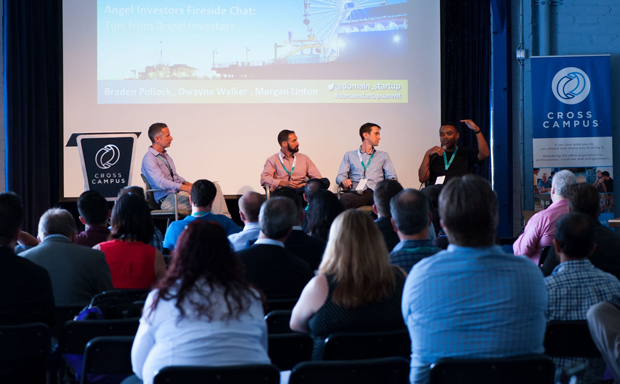 Above: The morning session continued with an Angel Investors Fireside Chat: Tips from Angel Investors featuring (left to right): moderator Michael Cyger and Angel Investors Braden Pollock, Morgan Linton and Dwayne Walker. 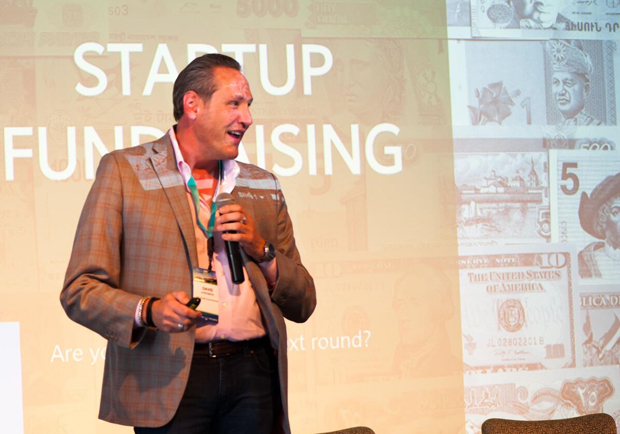 Below: David Ehrenberg, CEO at Early Growth Financial Services, closed out the morning session with a well received Keynote Address on Startup Fundraising 101. Above: After a lunch break and the 1pm Pitchfest session I told you about at the top of this report, the topic turned to Startup Branding: How Startups Are Using New Domain Brands in a panel discussion featuring (left to right) moderator Braden Pollock, Andee Hill (Donus Inc.), Muhammad Kausar Saleem (GDN Registry FZ), Lucas Webster (Shaving.club & The Grooming Network) and Page Howe (.LA Domain Names). 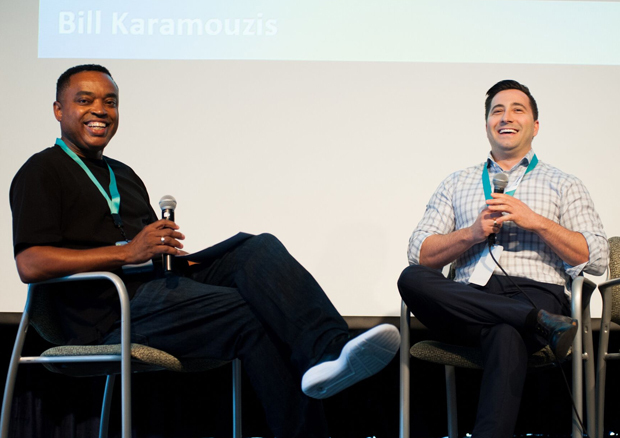 Below: Another highlight of the afternoon was this Fireside Chat: Startup Life - A Real Life Journey of Building and Selling Your Startup featuring moderator Dwayne Walker and Bill Karamouzis (MathGames.com and TeachMe.com). 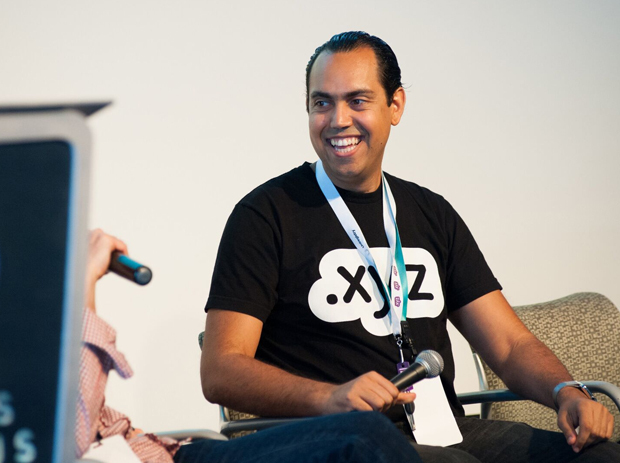 Above: The Domain Startup Summit's 3rd Keynote Address of the day featured .XYZ Registry Founder Daniel Negari who was interviewed by Braden Pollock. Daniel talked about How Startups Are Branding & Launching New Businesses. 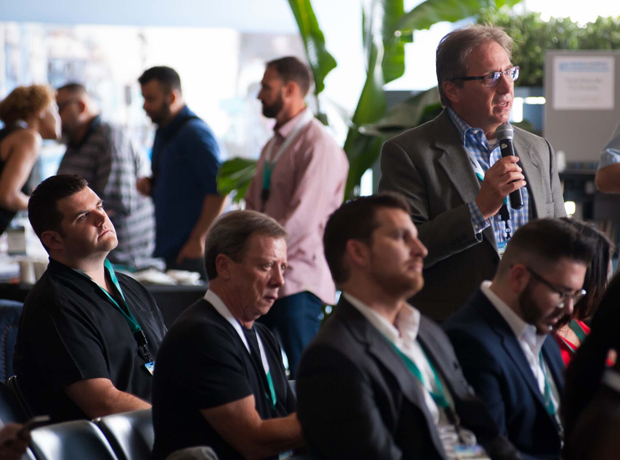 Below: Audience members like 101Domain's Joe Alagna (standing) had an opportunity to ask questions throughout the day including the final session covering Successful Startup MVPs: Tips On Building Successful Startup MVPs that featured Austin Truong (Linebreak.io), Carlos Orellana (IDEAS, Inc.), David Barlev (Goji Labs), Ron Peled (Educents). 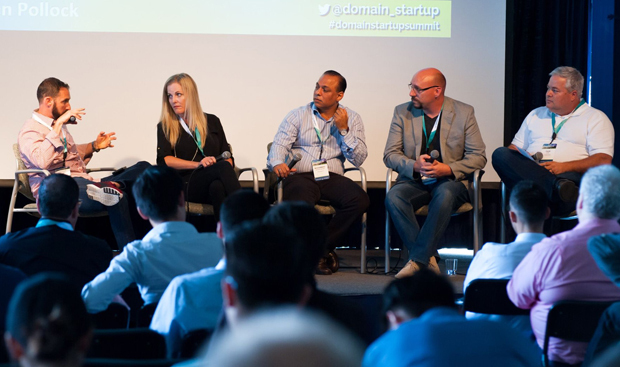 For Walker and Thompson the maiden voyage of DomainStartup Summit couldn't have gone much better. In a note the day after the show Thompson told me, "The energy was amazing. I'm still on Cloud 9!"